Been pretty busy at work since the RAW ride. Should have ridden on Wednesday morning because I woke up really early and decided to go the office at 6 AM only to find that Security doesn't come in till 7 so I couldn't get into my office because I still didn't have a key. That was a total waste of good morning. To make up for it, I rode Friday morning (6/23) in Paugussett. It was good ride. Fooled around in the forested area looking to make a loop off the forest road and add some miles to my workout loop. I may have found something but I am going to wait for winter to do something more permanent. What this trail will do is run through the area that was logged last year, pick up a section of Al's trail to kissing oak, then take the white trail back to the forest road. There is one blow down that needs some though about how to get over without having to stop any walk it. I might try piling rocks between the trees but I am not going to do anything till after hunting season. Saturday, I rode Lower Paugussett with Spillski of Crankfire fame. It was a total climb fest and since we just gotten about 4 inches of rain the day and night before everything was super slippery. None-the-less, a good ride, short, but good. Later that day, I noticed that my left knee hurt like the dickens. Especially when carrying Elliot down the stairs. Took some Aleve that helped somewhat but I could still feel it. Did a little research online and figured out that I had Patella Tendonitis, aka Volleyball knee. Nothing new, I have always had a problem with my left knee but I never thought that it might give me trouble from biking. Well, it does. I just have to make sure that I don't over due like I did by riding two days back to back. Also, I started to where this knee brace that I have had for the longest time. I never liked it because it always rode down on me when I was running. What I needed was a garter belt to keep it up. I could just see it now, I'd look like Dr Frankenfurter from the Rocky Horror Picture Show running down the road. The knee brace works great with my knee and shin gaurds on. Barely slips down. Rode the Pequonnock River Valley with Dave M. aka TrumbullCT from the Rag on Friday, with the brace and the knee felt great!!! 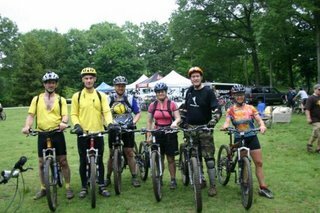 We had a member's meeting and ride on June 6th at Wadsworth SP. Besides the BOD, there were two members. Wadsworth is a nice little place if you are a beginner. Some tight single track and many carriarge roads. Little falls and Big falls are worth looking at. I posted some pics at CTNEMBA.org. After the ride we had Pizza, conducted our board meeting, and then I officially became a trail ambassador. Got a couple of Jerseys, a folding saw, and a Topeak multi-tool. Now when I ride, I can log my hours and report on any problems on the trails that I might come across. The following Monday, I showed a photographer for Mountain Biking Action around Huntington SP. Spent the weekend trying to coordinate some other CT NEMBA members to show up and was about to get Ed Perten and a riding buddy of his to come out. We ended doing a mile of Rock and Role and the photographer probably shot 100 or more pics at about 5 different spots. You had to ride through the "kill zone" (where the camera would take the picture and the flashes would go off) 10 or 15 times, each of us and then in groups. "Posing" for the camera while riding is tough work. 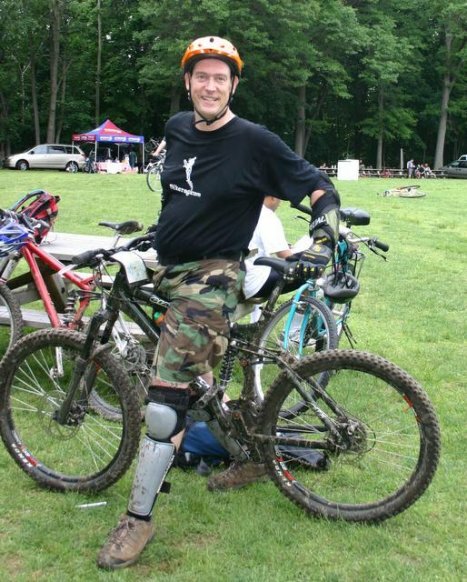 On Thursday of that week, I led my first CT NEMBA RAW (Ride After Work) ride at Mianus. A friend from work, Paul F, was there and there were two more NEMBA members. One guy that I only know as Marc F., who I don't think is an active member or I just couldn't find him in the membership database, and then a guy by the name of Dave M., who I happen to know from www.bikerag.com. It was good ride, we basically recreated the ride that Paul and I did with Alex F last month. Dave had to bail half way through due to back problems. It was great ride. I rode with my GPS mounted to my top tube and surprisingly, that is a very accurate position because we were in some dense tree cover and I never lost signal. I took a extra cell phone belt clip and zip tied it to the top tube and handlebars and I can see the screen for the most part. In late May I noticed that it looked like some ATV'ers were getting into the forest by way of the Horse trail up from Pond Brook, so I sent an email to DEP asking them if they could put up some boulders to block the entrance and instead they came out and put up a bunch of signs. That won't stop kids. DEP's response when I pushed further was that they will get in there one way or the other. From what I can tell, the signs are helping. Looks like there is going to be some cutting taking place just off the Polly Brody, I'd say about a half mile from the gate. Bunch of trees marked with blue. There is the makings for a trail in there that I have ridden a few times but I am going to wait and see what happens when the trees get cut. A big tree fell across the Polly Brody and took out a 4 inch tree in the process. The big tree was rotten and broke apart on the road but the smaller tree blocked the road. The one time I am riding in the forest without my pack saw is when I discovered this. I came back a week later with my saw and took care of business. It appears somebody has found my trail. I found foot prints in some of the muddy parts heading up hill. Didn't look like a mountain biker shoe, I think it might have been a hunter. I think it was still spring turkey season when I saw them. Speaking of my trail, I think I have a name for it, "The Muliken" trail in honor of the original owner of the this tract of land. I have seen ATV tracks going down the beginning part but it doesn't look like they are attempting to go any further than the end of the grass strip. Fortunately, they can't get past the hard left that goes into the DH section of the trail. The Up and Over, of course, is a good measure that will block them further. There are other places along the trail that will prevent ATVs from passing through. 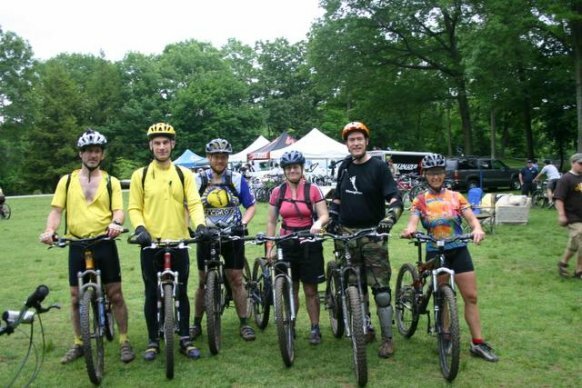 Drove over to Peekskill Sunday morning for the Westchester Mountain Biking Association's 11th Annual Fat Tire fest. Paula B and a few CT NEMBA folks along with a big crew from Crankfire.com were all there. There were rides for all levels. I lost track of the CT NEMBA ride and ended up riding in one of the Event's rides. Took some great shots along the way, especially a picture of Kathy H from Canondale doing a huge roller. I posted the best pictures on the CTNEMBA.org website. The Crankfire group went out for a long time and did some major trails. I ran into them 3/4s of the way through my ride. I had two nice crashes, didn't get hurt but they were sort of embarrassing. I was bonking big time. After lunch I met up with Paula and her crew and rode with them for another 5 miles. We went in the reverse of the ride that I did earlier that day. The festival was cool, there were demos and riding events. A kids race. I should have brought lunch but instead just had a burger from the mobile "choke and puke" vendor. Haven't had much time for posting because I have been riding! 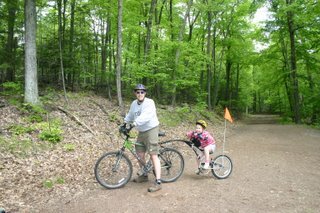 Lets see, after I got the rear derailleur fixed, most of May I rode in Upper Paugussett State Forest. 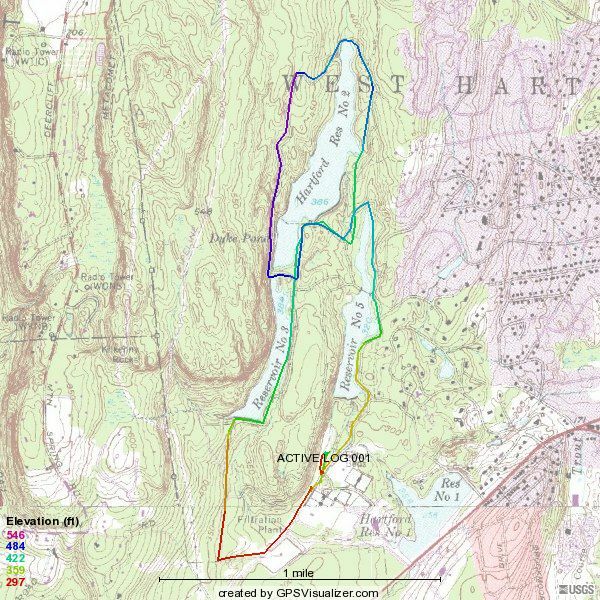 In fact I spent one ride marking the new trail CT NEMBA and Newtown Bridal Lands Association is working on in the Upper Paugussett but ran out of tape 3/4s of the way through the trail. 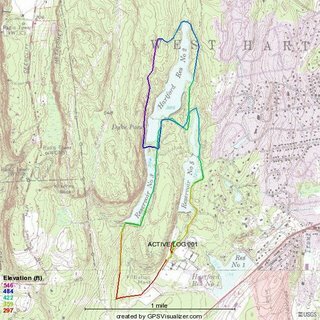 We are planning on rewalking the proposed trail in July. Katie and I did a Trailer Bike ride at West Hartford Reservoir for the Friends of MDC Day. "The Rez" as its known on www.crankfire.com has a great mix of paved, dirt roads, dual track and single track for riding. Katie and I started out on the paved roads and then hit the dirt and did some serious climbing. Of course she claimed to do all the work and I was along for the ride. After our ride, I distributed quite a few CT NEMBA postcards, by ensuring that all the cars in the parking lot that had bikes rack got a card. Then we visited all the booths for the MDC day. Katie had a great time learning about the environment and other activities that the MDC supports on their lands. We got snacks, freebies, and T-Shirts. A Daddy/Daughter Trailer Bike ride wouldn't be complete without a visit to Friendlies. Stopped at the one in Plainville. Nice conclusion to a fun day.